listen (help·info)), is the largest country in both South America and the Latin American region. It is the world's fifth largest country, both by geographical area and by population. It is the largest Portuguese-speaking country in the world, and the only one in the Americas. Brazil was inhabited by numerous tribal nations prior to the landing of traveler Pedro Álvares Cabral in 1500, who claimed the area for Portugal. Brazil remained a Portuguese colony until 1808, when the capital of the empire was transferred from Lisbon to Rio de Janeiro after French forces invaded Portugal. In 1815, it was elevated to the rank of kingdom upon the formation of the United Kingdom of Portugal, Brazil and the Algarves. Its independence was achieved in 1822 with the creation of the Empire of Brazil, a unitary state governed under a constitutional monarchy and a parliamentary system. The country became a presidential republic in 1889, when a military coup d'état proclaimed the Republic, although the bicameral legislature, now called Congress, dates back to the ratification of the first constitution in 1824. An authoritarian military junta had led the nation from 1964 until 1985. Brazil's current Constitution, formulated in 1988, defines it as a federal republic. The Federation is composed of the union of the Federal District, the 26 states, and the 5,570 municipalities. The country's economy is the world's seventh largest by both nominal GDP and purchasing power parity, as of 2012. A member of the BRIC group, Brazil until 2010 had one of the world's fastest growing major economies, with its economic reforms giving the country new international recognition and influence. Brazil's national development bank (BNDES) plays an important role for the country's economic growth. Brazil is a founding member of the United Nations, the G20, CPLP, Latin Union, the Organization of Ibero-American States, the Organization of American States, Mercosul and the Union of South American Nations. Brazil is a regional power in Latin America and a middle power in international affairs, with some analysts identifying it as an emerging global power. Brazil has been the world's largest producer of coffee for the last 150 years. The word "Brazil" comes from brazilwood, a tree that once grew plentifully along the Brazilian coast. In Portuguese, brazilwood is called pau-brasil, with the word brasil commonly given the etymology "red like an ember", formed from Latin brasa ("ember") and the suffix -il (from -iculum or -ilium). As brazilwood produces a deep red dye, it was highly valued by the European cloth industry and was the earliest commercially exploited product from Brazil. Throughout the 16th century, massive amounts of brazilwood were harvested by indigenous peoples (mostly Tupi) along the Brazilian coast, who sold the timber to European traders (mostly Portuguese, but also French) in return for assorted European consumer goods. The official Portuguese name of the land, in original Portuguese records, was the "Land of the Holy Cross" (Terra da Santa Cruz), but European sailors and merchants commonly called it simply the "Land of Brazil" (Terra do Brasil) on account of the brazilwood trade. The popular appellation eclipsed and eventually supplanted the official Portuguese name. Early sailors sometimes also called it the "Land of Parrots" (Terra di Papaga). Ceramics produced by ancient complex societies living in the Santarém region. One of the earliest human remains found in The Americas, Luzia Woman, were found in the area of Pedro Leopoldo, Minas Gerais and provide evidence of human habitation going back at least 11,000 years. The earliest pottery ever found in the Western Hemisphere was excavated in the Amazon basin of Brazil and radiocarbon dated to 8,000 years ago (6000 BC). The pottery was found near Santarém and provides evidence that the tropical forest region supported a complex prehistoric culture. Around the time of the Portuguese arrival, the territory of current day Brazil had an estimated indigenous population of 7 million people, mostly semi-nomadic who subsisted on hunting, fishing, gathering, and migrant agriculture. The indigenous population of Brazil comprised several large indigenous ethnic groups (e.g. the Tupis, Guaranis, Gês and Arawaks). The Tupí people were subdivided into the Tupiniquins and Tupinambás, and there were also many subdivision of the other groups. Before the arrival of Europeans, the boundaries between these groups and their subgroups were marked by wars that arose from differences in culture, language and moral beliefs. These wars also involved large-scale military actions on land and water, with cannibalistic rituals on POWs. While heredity had some weight, leadership status was more subdued over time, than allocated in succession ceremonies and conventions. Slavery among the Indians had a different meaning than it had for Europeans, since it originated from a diverse socio-economic organization, in which asymmetries were translated into kinship relations. Representation of the landing of Pedro Álvares Cabral at Porto Seguro in 1500. However, the decentralized and unorganized tendencies of the captaincy colonies proved problematic, and in 1549 the Portuguese king restructured them into the Governorate General of Brazil, a single and centralized Portuguese colony in South America. In the first two centuries of colonization, Indigenous and Europeans groups lived in constant war, establishing opportunistic alliances in order to gain advantages against each other. By the mid-16th century, cane sugar had become Brazil's most important exportation product, and slaves purchased in Sub-Saharan Africa, in the slave market of Western Africa (not only those from Portuguese allies of their colonies in Angola and Mozambique), had become its largest import, to cope with plantations of sugarcane, due to increasing international demand for Brazilian sugar. Painting showing the arrest of Tiradentes; he was sentenced to death for his involvement in the best known movement for independence in Colonial Brazil. By the end of the 17th century, sugarcane exports began to decline, and the discovery of gold by bandeirantes in the 1690s would become the new backbone of the colony's economy, fostering a Brazilian Gold Rush, attracting thousands of new settlers to Brazil, from Portugal and all Portuguese colonies around the World, which in turn caused some conflicts between newcomers and old settlers. The Portuguese colonial administration in Brazil had two objectives that would ensure colonial order, and the monopoly of its wealthiest and largest colony: both keep under control and eradicate all forms of slaves' rebellion and resistance, such as the Quilombo of Palmares, as well as repress all movements for autonomy or independence, such as the Minas Conspiracy. In late 1807, Spanish and Napoleonic forces threatened the security of continental Portugal, causing Prince Regent João, in the name of Queen Maria I, to move the royal court from Lisbon to Brazil. There they established some of Brazil's first financial institutions, such as its local stock exchanges, a National Bank, and ended the monopoly of the colony trade with Portugal, opening it to other nations. In 1809, in retaliation for being forced into exile, the Prince Regent ordered the Portuguese conquest of French Guiana. With the end of the Peninsular War in 1814, the courts of Europe demanded that Queen Maria I and Prince Regent João return to Portugal, deeming it unfit for the head of an ancient European monarchy to reside in a colony. In 1815, in order to justify continuing to live in Brazil, where the royal court had thrived for the past six years, the Crown established the United Kingdom of Portugal, Brazil, and the Algarves, thus creating a pluricontinental transatlantic monarchic state. However, such a ploy didn't last long, since the leadership in Portugal resentful with the new status of its larger colony, continued to require the return of court to Lisbon (as postulated by the Liberal Revolution of 1820), as well as groups of Brazilians, impatient for practical and real changes still demanded independence and a republic, as showed by the 1817 Pernambucan Revolt. In 1821, as a demand of revolutionaries who had taken the city of Porto, D. João VI was unable to hold out any longer, and departed for Lisbon. There he swore oath to the new constitution, leaving his son, Prince Pedro de Alcântara, as Regent of the Kingdom of Brazil. Declaration of the Brazilian independence by the later Emperor Dom Pedro I on September 7, 1822. Tensions between Portuguese and Brazilians increased, and the Portuguese Cortes, guided by the new political regime imposed by the 1820 Liberal Revolution, tried to re-establish Brazil as a colony. The Brazilians refused to yield, and Prince Pedro decided to stand with them, declaring the country's independence from Portugal on 7 September 1822. A month later, Prince Pedro was declared the first Emperor of Brazil, with the regnal title of Dom Pedro I, resulting in the foundation of the Empire of Brazil. The Brazilian War of Independence, which had already begun along this process, spread through northern, northeastern regions and in Cisplatina province. With the last Portuguese soldiers surrendering on 8 March 1824, Portugal officially recognized Brazil on 29 August 1825. In 7 April 1831, worn down by years of administrative turmoil and political dissensions with both liberal and conservative sides of politics, including an attempt of republican secession, as well as unreconciled with the way that absolutists in Portugal had given to the succession of King John VI, Pedro I went to Portugal to reclaim his daughter's crown, abdicating the Brazilian throne in favor of his five-year-old son and heir (who thus became the Empire's second monarch, with the regnal title of Dom Pedro II). During the last phase of the monarchy, internal political debate was centered on the issue of slavery. The Atlantic slave trade was abandoned in 1850, as a result of the British' Aberdeen Act, but only in May 1888 after a long process of internal mobilization and debate for an ethical and legal dismantling of slavery in the country, was the institution formally abolished. The foreign affairs in the monarchy were basically related issues with the countries of the Southern Cone with which Brazil has borders. Long after the Cisplatine War that resulted in independence for Uruguay, Brazil won three international wars during the 58-year reign of Pedro II. These were the Platine War, the Uruguayan War and the devastating Paraguayan War, the largest war effort in Brazilian history. Proclamation of the Republic, 1893, oil on canvas by Benedito Calixto (1853-1927). In half of the first 100 years of republic in Brazil, the Army exercised power directly or through figures designated by it. 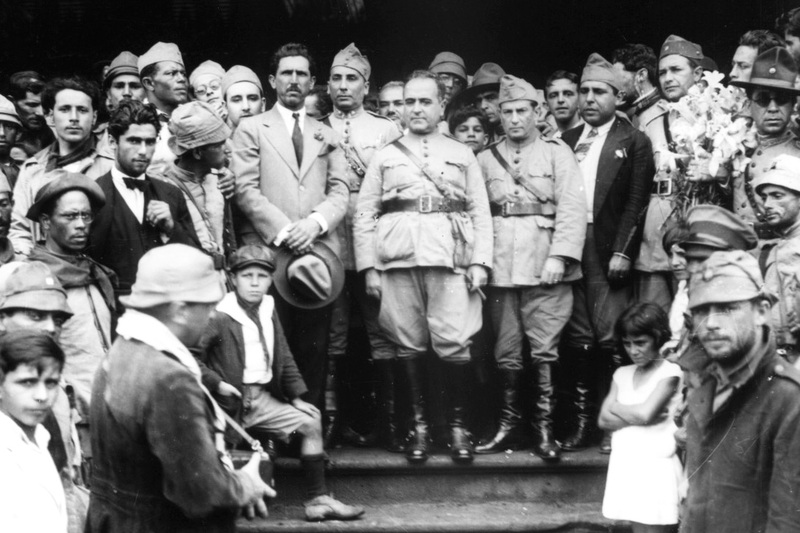 Getúlio Vargas (center, bald, no hat), for example, was the military's confidence man brought to power in October 1930. Little by little, a cycle of general instability sparked by these crises undermined the regime to such an extent, that by 1930 in the wake of the murder of his running mate, the defeated opposition presidential candidate Getúlio Vargas supported by most of the military, led a successful revolt. Vargas was supposed to assume power temporarily, but instead closed the Congress, extinguished the Constitution, ruled with emergency powers and replaced the states' governors with his own supporters. In the 1930s, three major attempts to remove Vargas and his supporters from power occurred: in the second half of 1932, in November 1935, and in May 1938. Being the second one, the communist revolt, used as an excuse for the preclusion of elections, put into effect by a coup d'état in 1937, which made the Vargas regime a full dictatorship, noted for its brutality and censorship of the press. With the allied victory in 1945 and the end of the Nazi-fascist regimes in Europe, Vargas's position became unsustainable and he was swiftly overthrown in another military coup, with Democracy being "reinstated" by the same army that had discontinued it 15 years before. Vargas committed suicide in August 1954 amid a political crisis, after having returned to power by election in 1950. Several brief interim governments succeeded after Vargas's suicide. Juscelino Kubitschek became president in 1956 and assumed a conciliatory posture towards the political opposition that allowed him to govern without major crises. The economy and industrial sector grew remarkably, but his greatest achievement was the construction of the new capital city of Brasília, inaugurated in 1960. His successor was Jânio Quadros, who resigned in 1961 less than a year after taking office. His vice-president, João Goulart, assumed the presidency, but aroused strong political opposition and was deposed in April 1964 by a coup that resulted in a military regime. The new regime was intended to be transitory but it gradually closed in on itself and became a full dictatorship with the promulgation of the Fifth Institutional Act in 1968. The repression was not limited to only those who resorted to guerrilla tactics to fight the regime, but also reached institutional opponents, artists, journalists and other members of civil society, inside and outside the country (through the infamous "Operation Condor"). Despite its brutality, like other totalitarian regimes in history, due to an economic boom, known as an "economic miracle", the regime reached its highest level of popularity in the early 1970s. Slowly however, the wear and tear of years of dictatorial power that have not slowed the repression, even after the defeat of the leftist guerrillas, plus the inability to deal with the economic crises of the period and popular pressure, made an opening policy inevitable, which from the regime side was led by Generals Geisel and Golbery. With the enactment of the Amnesty Law in 1979, Brazil began its slow return to democracy, which would be completed during the 1980s. Civilians returned to power in 1985 when José Sarney assumed the presidency, becoming unpopular during his tenure due to his failure in controlling the economic crisis and hyperinflation inherited from the military regime. Sarney's unsuccessful government allowed the election in 1989 of the almost unknown Fernando Collor, who was subsequently impeached by the National Congress in 1992. Collor was succeeded by his Vice-President Itamar Franco, who appointed Fernando Henrique Cardoso as Minister of Finance. In 1994, Cardoso produced a highly successful Plano Real, that, after decades of failed economic plans made by previous governments attempting to curb hyperinflation, finally granted stability to the Brazilian economy, leading Cardoso to be elected that year, and again in 1998. The peaceful transition of power from Fernando Henrique to his main opposition leader, Luís Inácio Lula da Silva, who was elected in 2002 and re-elected in 2006, proved that Brazil had finally succeeded in achieving its long-sought political stability. Lula was succeeded in 2011 by the current president, Dilma Rousseff, the country's first woman president and as such one of the most powerful women in the world. Brazil occupies a large area along the eastern coast of South America and includes much of the continent's interior, sharing land borders with Uruguay to the south; Argentina and Paraguay to the southwest; Bolivia and Peru to the west; Colombia to the northwest; and Venezuela, Guyana, Suriname and the French overseas department of French Guiana to the north. It shares a border with every South American country except for Ecuador and Chile. It also encompasses a number of oceanic archipelagos, such as Fernando de Noronha, Rocas Atoll, Saint Peter and Paul Rocks, and Trindade and Martim Vaz. Its size, relief, climate, and natural resources make Brazil geographically diverse. Including its Atlantic islands, Brazil lies between latitudes 6°N and 34°S, and longitudes 28° and 74°W. 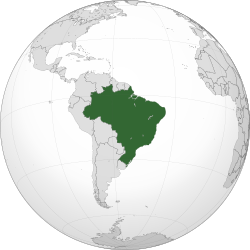 Brazil is the fifth largest country in the world, and third largest in the Americas, with a total area of 8,515,767.049 km2 (3,287,956 sq mi), including 55,455 km2 (21,411 sq mi) of water. It spans four time zones; from UTC−5 comprising the state of Acre and the westernmost portion of Amazonas, to UTC−4 in the western states, to UTC−3 in the eastern states (the national time) and UTC−2 in the Atlantic islands. Brazil is the only country in the world that lies on the equator while having contiguous territory outside the tropics. Brazilian topography is also diverse and includes hills, mountains, plains, highlands, and scrublands. Much of the terrain lies between 200 metres (660 ft) and 800 metres (2,600 ft) in elevation. The main upland area occupies most of the southern half of the country. The northwestern parts of the plateau consist of broad, rolling terrain broken by low, rounded hills. Panorama of the Chapada Diamantina from the Pai Inácio Hill, in the Chapada Diamantina National Park, Bahia. Tropical climate in Tambaba beach, Paraíba. Snow in Caxias do Sul, Rio Grande do Sul. Over central Brazil rainfall is more seasonal, characteristic of a savanna climate. This region is as extensive as the Amazon basin but has a very different climate as it lies farther south at a higher altitude. In the interior northeast, seasonal rainfall is even more extreme. The semiarid climatic region generally receives less than 800 millimetres (31.5 in) of rain, most of which generally falls in a period of three to five months of the year and occasionally less than this, creating long periods of drought. Brazil's 1877–78 Grande Seca (Great Drought), the worst in Brazil's history, caused approximately half a million deaths. The one from 1915 was devastating too. The Amazon rainforest, the richest and most biodiverse rainforest in the world. The jaguar is a wild animal typical of Brazil, mainly in the Amazon jungle. Larger mammals inclde carnivores pumas, jaguars, ocelots, rare bush dogs, and foxes, and herbivores peccaries, tapirs, anteaters, sloths, opossums, and armadillos. Deer are plentiful in the south, and many species of New World monkeys are found in the northern rain forests. Concern for the environment has grown in response to global interest in environmental issues. Brazil's Amazon Basin is home to an extremely diverse array of fish species, including the red-bellied piranha. Despite its reputation as a ferocious freshwater fish, the red-bellied piranha is actually a generally timid scavenger. Biodiversity can contribute to agriculture, livestock, forestry and fisheries extraction. However, almost all economically exploited species of plants, such as soybeans and coffee, or animals, such as chickens, are imported from other countries, and the economic use of native species still crawls. In the Brazilian GDP, the forest sector represents just over 1% and fishing 0.4%. Dilma Rousseff, the current Brazilian president. The Brazilian Federation is the "indissoluble union" of the States, the Municipalities and the Federal District. The Union, the states and the Federal District, and the municipalities, are the "spheres of government". The Federation is set on five fundamental principles: sovereignty, citizenship, dignity of human beings, the social values of labor and freedom of enterprise, and political pluralism. The classic tripartite branches of government (executive, legislative and judicial under a checks and balances system) are formally established by the Constitution. The executive and legislative are organized independently in all three spheres of government, while the judiciary is organized only at the federal and state/Federal District spheres. Together with several smaller parties, four political parties stand out: Workers' Party (PT), Brazilian Social Democracy Party (PSDB), Brazilian Democratic Movement Party (PMDB) and Democrats (DEM). Fifteen political parties are represented in Congress. It is common for politicians to switch parties, and thus the proportion of congressional seats held by particular parties changes regularly. Almost all governmental and administrative functions are exercised by authorities and agencies affiliated to the Executive. The form of government is that of a democratic republic, with a presidential system. The president is both head of state and head of government of the Union and is elected for a four-year term, with the possibility of re-election for a second successive term. The current president is Dilma Rousseff, who was inaugurated on 1 January 2011. The President appoints the Ministers of State, who assist in government. Legislative houses in each political entity are the main source of law in Brazil. The National Congress is the Federation's bicameral legislature, consisting of the Chamber of Deputies and the Federal Senate. Judiciary authorities exercise jurisdictional duties almost exclusively. Brazilian Army participating in UN peacekeeping mission in Haiti. The armed forces of Brazil are the second largest in Latin America by active personnel and the largest by the level of military equipment. It consists of the Brazilian Army (including the Army Aviation Command), the Brazilian Navy (including the Marine Corps and Naval Aviation), and the Brazilian Air Force. The Army has 235,978 active personnel. The states' Military Police and the Military Firefighters Corps are described as an ancillary forces of the Army by the constitution, but are under the control of each state's governor. The Navy once operated some of the most powerful warships in the world with the two Minas Geraes-class dreadnoughts, which sparked a South American dreadnought race between Argentina, Brazil, and Chile. Today, it is a green water force and one of the ten navies that possess an aircraft carrier. The Air Force has about 700 manned aircraft in service. Brazil's international relations are based on Article 4 of the Federal Constitution, which establishes non-intervention, self-determination, international cooperation and the peaceful settlement of conflicts as the guiding principles of Brazil's relationship with other countries and multilateral organizations. According to the Constitution, the President has ultimate authority over foreign policy, while the Congress is tasked with reviewing and considering all diplomatic nominations and international treaties, as well as legislation relating to Brazilian foreign policy. Helicopter of the Federal Police Department. In Brazil, the Constitution establishes five different police agencies for law enforcement: Federal Police Department, Federal Highway Police, Federal Railroad Police, Military Police and Civil Police. Of these, the first three are affiliated to the federal authorities and the last two subordinate to the state governments. All police forces are the responsibility of the executive branch of any of the federal or estadual powers. The National Public Security Force also can act in public disorder situations arising anywhere in the country. The country still has above-average levels of violent crime and particularly high levels of gun violence and homicide. In 2012, the World Health Organization (WHO) estimated the number of 32 deaths per 100,000 inhabitants, one of the highest rates of intentional homicide of the world. The number considered tolerable by the WHO is about 10 homicides per 100,000 inhabitants. However, there are differences between the crime rates in the brazilian states; while in São Paulo the homicide rate registered in 2013 was 10.8 deaths per 100,000 inhabitants, in Alagoas was 64.7 homicides per 100,000 inhabitants. Brazil also has high levels of incarceration and the third largest prison population in the world (behind only China and the United States), with an estimated total of approximately 700,000 prisoners around the country (June 2014), an increase of about 300% compared to the index registered in 1992; the high number of prisoners eventually overloaded the Brazilian prison system, leading to a shortfall of about 200 thousand accommodations in the prison system. Brazil is a federation composed of 26 States, one Federal district (which contains the capital city, Brasília) and Municipalities. States have autonomous administrations, collect their own taxes and receive a share of taxes collected by the Federal government. They have a governor and a unicameral legislative body elected directly by their voters. They also have independent Courts of Law for common justice. Despite this, states have much less autonomy to create their own laws than in the United States. For example, criminal and civil laws can be voted by only the federal bicameral Congress and are uniform throughout the country. Brazil is the largest national economy in Latin America, the world's seventh largest economy at market exchange rates and the seventh largest in purchasing power parity (PPP), according to the International Monetary Fund and the World Bank. Brazil has a mixed economy with abundant natural resources. The Brazilian economy has been predicted to become one of the five largest in the world in the decades to come, the GDP per capita following and growing, provided that large investments in productivity gains are made to substitute the GDP growth of the last decade that is attributable to the increase in the number of people working. Its current GDP (PPP) per capita is $15,153 in 2014 putting Brazil in the 77th position according to IMF data. Active in agricultural, mining, manufacturing and service sectors Brazil has a labor force of over a 107 million (ranking 6th worldwide) and unemployment of 6.2% (ranking 64th worldwide). The country has been expanding its presence in international financial and commodities markets, and is one of a group of four emerging economies called the BRIC countries. Brazil has been the world's largest producer of coffee for the last 150 years. It has become the fourth largest car market in the world. Major export products include aircraft, electrical equipment, automobiles, ethanol, textiles, footwear, iron ore, steel, coffee, orange juice, soybeans and corned beef. Adding up, Brazil ranks 23rd worldwide in value of exports. Corruption costs Brazil almost $41 billion a year alone, with 69.9% of the country's firms identifying the issue as a major constraint in successfully penetrating the global market. Local government corruption is so prevalent that voters perceive it as a problem only if it surpasses certain levels, and only if a local media e.g. a radio station is present to divulge the findings of corruption charges. Initiatives, like this exposure, strengthen awareness which is indicated by the Transparency International's Corruption Perceptions Index; ranking Brazil 69th out of 178 countries in 2012. The purchasing power in Brazil is eroded by the so-called Brazil cost. The economy of the resource-rich nation had been booming until 2010, but stagnation followed and a recession is now underway, along with inflation and charges of corruption and the bankruptcy of a major oil business. Angry demonstrators in 2014 complained beforehand at the high $11.5 billion (USD) cost of sponsoring the FIFA World Cup, but Brazilians took pride in its smooth functioning. Brazilian President Dilma Rousseff faced a conservative challenger for her re-election bid in the October 26, 2014, runoff, but managed to secure a re-election with just over 51% of votes. P-51, an oil platform of Petrobras. Brazil is the world's tenth largest energy consumer with much of its energy coming from renewable sources, particularly hydroelectricity and ethanol; the Itaipu Dam is the world's largest hydroelectric plant by energy generation. The first car with an ethanol engine was produced in 1978 and the first airplane engine running on ethanol in 2005. Recent oil discoveries in the Pre-salt layer have opened the door for a large increase in oil production. The governmental agencies responsible for the energy policy are the Ministry of Mines and Energy, the National Council for Energy Policy, the National Agency of Petroleum, Natural Gas and Biofuels, and the National Agency of Electricity. The Itaipu Dam on the Paraná River, located on the border between Brazil and Paraguay, is the second largest of the world (the first is the Three Gorges Dam, in China). Approximately 75% of the Brazilian energy matrix, one of the cleanest in the world, comes from the hydropower. Iguazu Falls, Paraná, in Brazil-Argentina border, is the second most popular destination for foreign tourists who come to Brazil for pleasure. The waterfalls are only 20% in the Brazilian side, the rest belonging to Argentina. Sancho Bay, in Fernando de Noronha Archipelago, Pernambuco, elected the most beautiful beach in the world by TripAdvisor. In terms of the 2011 Travel and Tourism Competitiveness Index (TTCI), which is a measurement of the factors that make it attractive to develop business in the travel and tourism industry of individual countries, Brazil ranked 52nd in the world, 3rd among Latin American countries after Mexico and Costa Rica, and 7th in the Americas. Brazil's competitive advantages are its natural resources, which ranked 1st on this criteria out of the 139 countries considered, and ranked 23rd for its cultural resources, due to its many World Heritage sites. The TTCI report notes Brazil's main weaknesses: its ground transport infrastructure remains underdeveloped (ranked 116th), with the quality of roads ranking in 105th place; and the country continues to suffer from a lack of price competitiveness (ranked 114th), due in part to high ticket taxes and airport charges, as well as high prices and high taxation. Safety and security have improved significantly: 75th in 2011, up from 128th in 2008. According to the World Tourism Organization (WTO), international travel to Brazil accelerated in 2000, particularly during 2004 and 2005. However, in 2006 a slow-down took place, and international arrivals had almost no growth in 2007-08. In spite of this trend, revenues from international tourism continued to rise, from USD 4 billion in 2005 to 5 billion in 2007, despite 330 000 fewer arrivals. This favorable trend is the result of the strong devaluation of the US dollar against the Brazilian Real, which began in 2004, but which makes Brazil a more expensive international destination. This trend changed in 2009, when both visitors and revenues fell as a result of the Great Recession of 2008-09. By 2010, the industry had recovered, and arrivals grew above 2006 levels to 5.2 million international visitors, and receipts from these visitors reached USD 6 billion. In 2011 the historical record was reached with 5.4 million visitors and US$6.8 billion in receipts. Despite continuing record-breaking international tourism revenues, the number of Brazilian tourists travelling overseas has been growing steadily since 2003, resulting in a net negative foreign exchange balance, as more money is spent abroad by Brazilians than comes in as receipts from international tourists visiting Brazil. Tourism expenditures abroad grew from USD 5.8 billion in 2006, to USD 8.2 billion in 2007, a 42% increase, representing a net deficit of USD 3.3 billion in 2007, as compared to USD 1.5 billion in 2006, a 125% increase from the previous year. This trend is caused by Brazilians taking advantage of the stronger Real to travel and making relatively cheaper expenditures abroad. Brazilians traveling overseas in 2006 represented 4% of the country's population. In 2005, tourism contributed with 3.2% of the country's revenues from exports of goods and services, and represented 7% of direct and indirect employment in the Brazilian economy. In 2006 direct employment in the sector reached 1.9 million people. Domestic tourism is a fundamental market segment for the industry, as 51 million people traveled throughout the country in 2005, and direct revenues from Brazilian tourists reached USD 22 billion, 5.6 times more receipts than international tourists in 2005. National Synchrotron Light Laboratory in Campinas, state of São Paulo, the only particle accelerator in Latin America. Technological research in Brazil is largely carried out in public universities and research institutes, with the majority of funding for basic research coming from various government agencies. Brazil's most esteemed technological hubs are the Oswaldo Cruz Institute, the Butantan Institute, the Air Force's Aerospace Technical Center, the Brazilian Agricultural Research Corporation and the INPE. The Brazilian Space Agency has the most advanced space program in Latin America. Uranium is enriched at the Resende Nuclear Fuel Factory, mostly for research purposes (as Brazil obtains 88% from its electricity from hydroelectricity) and the country's first nuclear submarine will be delivered in 2015 (by France). Brazil is one of the three countries in Latin America with an operational Synchrotron Laboratory, a research facility on physics, chemistry, material science and life sciences. And Brazil is the only Latin American country to have a semiconductor company with its own fabrication plant, the CEITEC. Terminal 3 of the São Paulo–Guarulhos International Airport, the busiest airport in the country. For freight transport waterways are of importance, e.g. the industrial zones of Manaus can be reached only by means of the Solimões- Amazonas waterway (3,250 km (2,019 mi) with 6 meters minimum depth). The Albert Einstein Hospital in São Paulo is one of the most well-known health units in Brazil. Courtyard of the ancient Royal Academy of Artillery, Fortification and Design, the first institution of higher education in Brazil, created in 1792 and forerunner of the Federal University of Rio de Janeiro (UFRJ). President Dilma Rousseff at Jornal Nacional news program. Rede Globo is the second largest commercial television network of the world. Television in Brazil began officially on 18 September 1950, with the founding of TV Tupi by Assis Chateaubriand. Since then television has grown in the country, creating large public networks such as Globo, SBT, Record and Bandeirantes. Today it is the most important factor in popular culture of Brazilian society, indicated by research showing that as much as 67% of the general population follow the same daily soap opera broadcast. Digital Television, using the SBTVD standard (based on the Japanese standard ISDB-T), was adopted 29 June 2006 and launched in 2 November 2007. In May 2010, Brazil launched TV Brasil Internacional, an international television station, initially broadcasting to 49 countries. Population density of Brazilian municipalities. Basilica of the National Shrine of Our Lady of Aparecida in Aparecida do Norte, São Paulo, is the second largest Catholic church in the world. Religion in Brazil formed from the meeting of the Catholic Church with the religious traditions of enslaved African peoples and indigenous peoples. This confluence of faiths during the Portuguese colonization of Brazil led to the development of a diverse array of syncretistic practices within the overarching umbrella of Brazilian Catholicism, characterized by traditional Portuguese festivities, and in some instances, Allan Kardec's Spiritism (most Brazilian Spiritists are also Christians). Religious pluralism increased during the 20th century, and a Protestant community has grown to include over 22% of the population. The most common Protestant denominations are Pentecostal, Evangelical, Baptist, Seventh-day Adventist, Lutheran and the reformed churches. Catholicism is the country's predominant faith. Brazil has the world's largest Catholic population. According to the 2000 Demographic Census (the PNAD survey does not inquire about religion), 73.57% of the population followed Catholicism; 15.41% Protestantism; 1.33% Kardecist spiritism; 1.22% other Christian denominations; 0.31% Afro-Brazilian religions; 0.13% Buddhism; 0.05% Judaism; 0.02% Islam; 0.01% Amerindian religions; 0.59% other religions, undeclared or undetermined; while 7.35% have no religion. However, in the last ten years Protestantism, particularly Pentecostal and Evangelical Protestantism, has spread in Brazil, while the proportion of Catholics has dropped significantly. After Protestantism, individuals professing no religion are also a significant group, exceeding 7% of the population in the 2000 census. The cities of Boa Vista, Salvador and Porto Velho have the greatest proportion of Irreligious residents in Brazil. Teresina, Fortaleza, and Florianópolis were the most Roman Catholic in the country. Greater Rio de Janeiro, not including the city proper, is the most Irreligious and least Roman Catholic Brazilian periphery, while Greater Porto Alegre and Greater Fortaleza are on the opposite sides of the lists, respectively. Minority languages are spoken throughout the nation. One hundred and eighty Amerindian languages are spoken in remote areas and a significant number of other languages are spoken by immigrants and their descendants. In the municipality of São Gabriel da Cachoeira, Nheengatu (a currently endangered South American creole language – or an 'anti-creole', according to some linguists – with mostly Indigenous Brazilian languages lexicon and Portuguese-based grammar that, together with its southern relative língua geral paulista, once was a major lingua franca in Brazil, being replaced by Portuguese only after governmental prohibition led by major political changes), Baniwa and Tucano languages had been granted co-official status with Portuguese. Some aspects of Brazilian culture were influenced by the contributions of Italian, German and other European as well Japanese, Jewish and Arab immigrants who arrived in large numbers in the South and Southeast of Brazil. The indigenous Amerindians influenced Brazil's language and cuisine; and the Africans influenced language, cuisine, music, dance and religion. Men playing berimbau and pandeiro in a capoeira circle. Popular music since the late eighteenth century began to show signs of forming a characteristically Brazilian sound, with samba considered the most typical and on the UNESCO cultural heritage list. Maracatu and Afoxê are two Afro-Brazilian music traditions that have been popularized by their appearance in the annual Brazilian Carnivals. The sport of capoeira is usually played with its own music referred to as capoeira music, which is usually considered to be a call-and-response type of folk music. The Rio Carnival, a type of samba parade. Brigadeiro is a typical sweet of Brazilian cuisine. An average meal consists mostly of rice and beans with beef and salad. Often, it's mixed with cassava flour (farofa). Fried potatoes, fried cassava, fried banana, fried meat and fried cheese are very often eaten in lunch and served in most typical restaurants. Popular snacks are pastel (a pastry); coxinha (chicken croquete); pão de queijo (cheese bread and cassava flour / tapioca); pamonha (corn and milk paste); esfirra (Lebanese pastry); kibbeh (from Arabic cuisine); empanada (pastry) and empada, little salt pies filled with shrimps or heart of palm. Brazil has a variety of candies such as brigadeiros (chocolate fudge balls), cocada (a coconut sweet), beijinhos (coconut truffles and clove) and romeu e julieta (cheese with a guava jam known as goiabada). Peanuts are used to make paçoca, rapadura and pé-de-moleque. Local common fruits like açaí, cupuaçu, mango, papaya, cocoa, cashew, guava, orange, passionfruit, pineapple, and hog plum are turned in juices and used to make chocolates, popsicles and ice cream. Ayrton Senna, one of the biggest names in F1 history. Volleyball, basketball, auto racing, and martial arts also attract large audiences. The Brazil men's national volleyball team, for example, currently holds the titles of the World League, World Grand Champions Cup, World Championship and the World Cup. ^ Exército Brasileiro. "Hino à Bandeira Nacional" (in Portuguese). http://www.eb.mil.br/web/midia-eletronica/hino-a-bandeira-nacional. Retrieved January 29, 2014. .
^ "Demographics". Brazilian Government. Archived from the original on 17 November 2011. https://web.archive.org/web/20111117051415/http://www.brasil.gov.br/sobre/brazil/brazil-in-numbers/demographics. Retrieved 8 October 2011. ^ "Caracteristicas da População e dos Domicílios do Censo Demográfico 2010 — Cor ou raça" (PDF). http://www.ibge.gov.br/home/estatistica/populacao/censo2010/caracteristicas_da_populacao/tabelas_pdf/tab3.pdf. Retrieved 7 April 2012. ^ "2014 Population Estimates". IBGE. ftp://ftp.ibge.gov.br/Estimativas_de_Populacao/Estimativas_2014/estimativa_dou_2014.pdf. ^ a b c d e "Brazil". International Monetary Fund (IMF). http://www.imf.org/external/pubs/ft/weo/2014/02/weodata/weorept.aspx?pr.x=89&pr.y=7&sy=2012&ey=2019&scsm=1&ssd=1&sort=country&ds=.&br=1&c=223&s=NGDPD%2CNGDPDPC%2CPPPGDP%2CPPPPC&grp=0&a=. Retrieved 29 October 2014. ^ Country Comparison to the World: Gini Index – Brazil The World Factbook. Retrieved on 3 April 2012. ^ José María Bello (1966). A History of Modern Brazil: 1889-1964. Stanford University Press. p. 56. ISBN 978-0-8047-0238-6. http://books.google.com/books?id=O26rAAAAIAAJ&pg=PA56. ^ S. George Philander (2012). Encyclopedia of Global Warming and Climate Change, Second Edition. Princeton University. p. 148. ISBN 978-1-4129-9261-9. http://books.google.com/books?id=B8VE92tDqEEC&pg=PA148. ^ John J. Crocitti; Monique Vallance (2011). Brazil Today: An Encyclopedia of Life in the Republic. South Dakota State University. p. 23. ISBN 978-0-313-34673-6. http://books.google.com/books?id=vP9jHaoL_s4C&pg=PR23. ^ a b c d e f "Geography of Brazil". The World Factbook. Central Intelligence Agency. 2008. https://www.cia.gov/library/publications/the-world-factbook/geos/br.html. Retrieved 3 June 2008. ^ "BRAZIL - Land". http://www.un.int/brazil/brasil/brazil-land.htm. ^ a b c d e f g h i j k l m n o p "Brazilian Federal Constitution" (in Portuguese). Presidency of the Republic. 1988. http://www.planalto.gov.br/ccivil_03/Constituicao/Constituiçao.htm. Retrieved 3 June 2008. "Brazilian Federal Constitution". v-brazil.com. 2007. http://www.v-brazil.com/government/laws/titleI.html. Retrieved 3 June 2008. "Unofficial translate"
^ "CIA – The World Factbook – Country Comparisons – GDP (purchasing power parity)". Cia.gov. https://www.cia.gov/library/publications/the-world-factbook/rankorder/2001rank.html. Retrieved 25 January 2011. ^ Clendenning, Alan (17 April 2008). "Booming Brazil could be world power soon". USA Today – The Associated Press. p. 2. http://www.usatoday.com/money/economy/2008-04-17-310212789_x.htm. Retrieved 12 December 2008. ^ Fernando J. Cardim de Carvalho (January 2013). "Relative insulation". D+C Development and Cooperation/ dandc.eu. http://www.dandc.eu/en/article/brazils-state-owned-development-bank-bndes-probably-more-powerful-many-countrys-federal. ^ "Países Membros" (in Portuguese). United Nations Information Centre Rio de Janeiro. Archived from the original on 29 March 2012. https://web.archive.org/web/20120329074219/http://unic.un.org/imucms/rio-de-janeiro/64/263/paises-membros.aspx. Retrieved 10 April 2013. ^ Clare Ribando Seelke (2010). Brazil-U. S. Relations. Congressional Research Service. p. 1. ISBN 978-1-4379-2786-3. http://books.google.com/books?id=AedJmV-wedMC&pg=PA1. ^ Jorge Dominguez; Byung Kook Kim (2013). Between Compliance and Conflict: East Asia Latin America and the New Pax Americana. Center for International Affairs, Harvard University. pp. 98–99. ISBN 978-1-136-76983-2. http://books.google.com/books?id=c0I_4JmjFbwC&pg=PA98. ^ a b Jeff Neilson, Bill Pritchard (26 July 2011). Value Chain Struggles. John Wiley & Sons. p. 102. http://books.google.co.uk/books?id=wokuHhx1AOUC&pg=PA1834#v=onepage&q&f=false. ^ Boris Fausto (1999). A Concise History of Brazil. Cambridge University Press. p. 9. ISBN 978-0-521-56526-4. http://books.google.com/books?id=HJdaM325m8IC&pg=PA9. ^ a b Jon S. Vincent. Ph.D. (2003). Culture and Customs of Brazil. Greenwood Publishing Group. p. 36. ISBN 978-0-313-30495-8. http://books.google.com/books?id=HHobg0djRbEC&pg=PA36. ^ Richard P. Tucker (2007). Insatiable Appetite: The Ecological Degradation of the Tropical World. University of Michigan.. p. 186. ISBN 978-0-7425-5365-1. http://books.google.com/books?id=2V2q30BdEJ8C&pg=PA186. ^ Wayne E. Lee (2011). Empires and Indigenes: Intercultural Alliance, Imperial Expansion, and Warfare in the Early Modern World. NYU Press. p. 196. ISBN 978-0-8147-6527-2. http://books.google.com/books?id=xatMrooibacC&pg=PA196. ^ Bonnier Corporation (1880). Popular Science. Bonnier Corporation. p. 493. ISSN 01617370. http://books.google.com/books?id=hiQDAAAAMBAJ&pg=PA493. ^ Jean de Léry (1990). History of a Voyage to the Land of Brazil, Otherwise Called America. University of California Press. p. 242. ISBN 978-0-520-91380-6. http://books.google.com/books?id=F8qqKoCSWVkC&pg=PA242. ^ Jayme A. Sokolow. Ph.D. (2003). The Great Encounter: Native Peoples and European Settlers in the Americas, 1492-1800. M.E. Sharpe. p. 84. ISBN 978-0-7656-0982-3. http://books.google.com/books?id=ytghV9q6v3cC&pg=PA84. ^ Maria Herrera-Sobek (2012). Celebrating Latino Folklore. ABC-CLIO. p. 155. ISBN 978-0-313-34340-7. http://books.google.com/books?id=lY-tY62V1FIC&pg=PA155. ^ Robert M. Levine; John J. Crocitti (1999). The Brazil Reader: History, Culture, Politics. Duke University Press. pp. 11–. ISBN 978-0-8223-2290-0. http://books.google.com/books?id=R28K2JA9PM8C&pg=PA11. Retrieved 12 December 2012. ^ a b Jeffrey C. Mosher (2008). Political Struggle, Ideology, and State Building: Pernambuco and the Construction of Brazil, 1817-1850. U of Nebraska Press. p. 9. ISBN 978-0-8032-3247-1. http://books.google.com/books?id=T_yszWOZUCkC&pg=PA9. ^ Jeremy Adelman (2006). Sovereignty and Revolution in the Iberian Atlantic. Princeton University Press. pp. 334–. ISBN 978-0-691-12664-7. http://books.google.com/books?id=nvFpURNsBRIC&pg=PA334. ^ Ibidem Fausto 1999, Chapter 2, page 83, and 2.6 "The Paraguayan War"
^ Ibidem Smallman 2002, end of Chapter 1, from page 18 "Military rule"
^ Frank M. Colby, Allen L. Churchill, Herbert T. Wade & Frank H. Vizetelly; "The New international year book" Dodd, Mead & Co. 1989, p. 102 "The Fascist Revolt"
^ Gaspari, A Ditadura Envergonhada, pp. 141–142. ^ Ibidem Fausto 1999, Chapter 6 "The military government and the transition to democracy (1964-1984)"
^ Fausto (2005), pp. 464–465. ^ "The World's 100 most powerful women". Forbes. 2013. http://www.forbes.com/power-women/. Retrieved 24 March 2013. ^ "Brazil elects Dilma Rousseff, nation's first woman president". CNN. 31 October 2010. http://articles.cnn.com/2010-10-31/world/brazil.elections_1_voting-machines-president-luiz-inacio-manaus?_s=PM:WORLD. Retrieved 8 August 2011. ^ "Câmara adia a votação da PEC 37". ÉPOCA. 20 June 2013. http://revistaepoca.globo.com/Brasil/noticia/2013/06/camara-adia-votacao-da-pec-37.html. Retrieved 23 October 2013. ^ a b "Land and Resources". Encarta. MSN. http://encarta.msn.com/encyclopedia_761554342/Brazil.html#s1. Retrieved 11 June 2008. ^ "Hora Legal Brasileira". Observatório Nacional. http://pcdsh01.on.br/Fusbr.htm. Retrieved 28 December 2014. ^ a b c d e "Natural Regions". Encarta. MSN. http://encarta.msn.com/encyclopedia_761554342/Brazil.html#s1. Retrieved 11 June 2008. ^ a b "Rivers and Lakes". Encarta. MSN. http://encarta.msn.com/encyclopedia_761554342/Brazil.html. Retrieved 11 June 2008. ^ a b c d e "Brazil". Country Guide. BBC Weather. Archived from the original on 8 February 2011. https://web.archive.org/web/20110208034235/http://www.bbc.co.uk/weather/world/country_guides/results.shtml?tt=TT005220. Retrieved 11 June 2008. ^ a b c d e "Natural Regions". Encarta. MSN. http://encarta.msn.com/encyclopedia_761554342_2/Brazil.html. Retrieved 11 June 2008. ^ a b c "Temperature in Brazil". Brazil Travel. http://www.v-brazil.com/information/geography/temperature-graphs.html. Retrieved 11 June 2008. ^ Embrapa. "Annual averages of Mandacaru Agro-meteorological station" (in Portuguese). Archived from the original on 20 August 2007. https://web.archive.org/web/20070820215606/http://www.cpatsa.embrapa.br/servicos/dadosmet/cem-anual.html. Retrieved 21 October 2008. ^ "CPD: South America, Site SA19, Caatinga of North-eastern Brazil, Brazil". Botany.si.edu. http://botany.si.edu/projects/cpd/sa/sa19.htm. Retrieved 29 October 2009. ^ "Ó Gráda, C.: Famine: A Short History." Princeton University Press. ^ a b "One fifth of the world's freshwater". Amazon. World Wide Fund for Nature. 6 August 2007. http://wwf.panda.org/what_we_do/where_we_work/amazon/about_the_amazon/ecosystems_amazon/rivers/. Retrieved 12 June 2008. ^ a b c d "Plant and Animal Life". Encarta. MSN. http://encarta.msn.com/encyclopedia_761554342_2/Brazil.html. Retrieved 12 June 2008. ^ "Atlantic Forest, Brazil". Map: Biodiversity hotspots (BBC News). 1 October 2004. http://news.bbc.co.uk/2/hi/science/nature/3707888.stm#brazil. Retrieved 12 June 2008. ^ a b "Environmental Issues". Encarta. MSN. http://encarta.msn.com/encyclopedia_761554342_2/Brazil.html. Retrieved 12 June 2008. ^ "Under threat". Greenpeace. http://www.greenpeace.org/international/en/campaigns/forests/south-america/under-threat/. Retrieved 12 June 2008. ^ "Amazon destruction: six football fields a minute". Greenpeace. Archived from the original on 5 April 2008. https://web.archive.org/web/20080405192352/http://www.greenpeace.org/international/news/amazon-destruction. Retrieved 12 June 2008. ^ a b "Embassy of Brazil — Ottawa". Archived from the original on 25 July 2011. https://web.archive.org/web/20110725100724/http://www.brasembottawa.org/en/brazil_in_brief/political_institution.html. Retrieved 19 July 2007. "Political Institutions — The Executive"
^ "City Mayors". http://www.citymayors.com/government/brazil_government.html. Retrieved 19 July 2007. 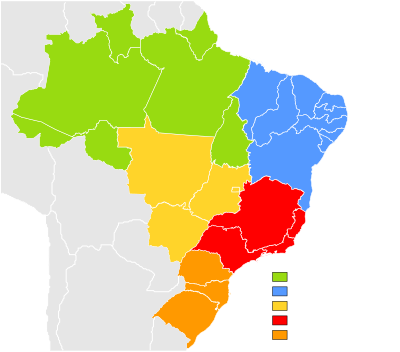 "Brazil federal, state and local government"
^ "Government – Brazil". Southtravels.com. 5 October 1988. http://www.southtravels.com/america/brazil/government.html. Retrieved 17 March 2010. ^ Fabiano Deffenti; Welber Oliveira Barral (2011). Introduction to Brazilian Law. Kluwer Law International. pp. 20–. ISBN 978-90-411-2506-4. http://books.google.com/books?id=1Ba2J5eD8wYC&pg=PA20. Retrieved 6 June 2013. ^ Diego Abreu, "Primeira Corte do mundo a ter canal de vídeo no YouTube é o STF," G1. (Portuguese) Accessed 12 October 2009. ^ "STF: Primeira corte do mundo no YouTube." ESMA-PB. (Portuguese) Accessed 12 October 2009. ^ "Página do STF no Twitter está no ar" (12 January 2009). STF Official Website. (Portuguese) Consulted on 5 December 2009. ^ Uma Nova Agenda Militar Revista Época. Retrieved on 19 February 2009. ^ "Decreto Nº 5.670 de 10 de Janeiro de 2006" (in Portuguese). Presidência da República. http://www.planalto.gov.br/ccivil_03/_Ato2004-2006/2006/Decreto/D5670.htm. Retrieved 2 October 2010. ^ Scheina (1987), pp. 81. ^ "Perguntas" (in Portuguese). Marinha do Brasil. https://www.mar.mil.br/menu_v/ccsm/perguntas/perguntas_mais_frequentes.htm#44.44. Retrieved 16 August 2007. ^ "Sala de imprensa – FAB em números" (in Portuguese). Força Aérea Brasileira. http://www.fab.mil.br/portal/imprensa/fab_numeros.php. Retrieved 12 December 2007. ^ "Especial - NOTÍCIAS - Uma nova agenda militar". Revistaepoca.globo.com. http://revistaepoca.globo.com/Revista/Epoca/0,,EMI14439-15273-3,00-UMA+NOVA+AGENDA+MILITAR.html. Retrieved 19 June 2010. ^ "CIA - The World Factbook". Cia.gov. https://www.cia.gov/library/publications/the-world-factbook/geos/br.html. Retrieved 2 October 2013. ^ "People's Daily Online - Bolivia bans Argentina from reselling gas to Chile". English.peopledaily.com.cn. 25 October 2006. http://english.peopledaily.com.cn/200610/25/eng20061025_315049.html. Retrieved 19 June 2010. ^ "Fresh anger over Bolivia gas plan". BBC News. 16 April 2004. http://news.bbc.co.uk/2/hi/americas/3632235.stm. Retrieved 1 April 2010. ^ "Especial - NOTÍCIAS - Os pés de barro de um gigante". Revistaepoca.globo.com. http://revistaepoca.globo.com/Revista/Epoca/1,,EMI14440-15273,00.html. Retrieved 19 June 2010. ^ Rohter, Larry (1 August 2004). "Brazil Is Leading a Largely South American Mission to Haiti". The New York Times. http://query.nytimes.com/gst/fullpage.html?res=9901E4DD1F3DF932A3575BC0A9629C8B63. Retrieved 1 April 2010. ^ "Ordem pública é prioridade da Força Nacional de Segurança". Portal Brasil. 2012-04-29. http://www.brasil.gov.br/defesa-e-seguranca/2012/05/ordem-publica-e-prioridade-da-forca-nacional-de-seguranca. Retrieved 2015-02-08. ^ "Brasil tem maior número absoluto de homicídios do mundo". O Estado de S. Paulo. 10 December 2014. http://brasil.estadao.com.br/noticias/geral,brasil-tem-maior-numero-absoluto-de-homicidios-do-mundo,1604827. ^ "Taxa de delito por 100 mil habitantes". Secretaria de Segurança Pública do Estado de São Paulo. 31 January 2011. Archived from the original on 23 August 2011. http://www.webcitation.org/619lg4o87. Retrieved 14 February 2011. ^ "Os estados com mais homicídios no Brasil". Exame. 11 November 2014. http://exame.abril.com.br/brasil/noticias/uma-pessoa-e-assassinada-a-cada-dez-minutos-no-brasil. Retrieved 5 February 2015. ^ "Brasil passa a Rússia e tem a terceira maior população carcerária do mundo". Folha de S. Paulo. 5 June 2014. http://www1.folha.uol.com.br/cotidiano/2014/06/1465527-brasil-passa-a-russia-e-tem-a-terceira-maior-populacao-carceraria-do-mundo.shtml. ^ "Brasil tem hoje deficit de 200 mil vagas no sistema prisional". G1. 15 January 2014. http://g1.globo.com/brasil/noticia/2014/01/brasil-tem-hoje-deficit-de-200-mil-vagas-no-sistema-prisional.html. Retrieved 21 March 2014. ^ "Embraer vê clientes mais dispostos à compra de aviões". Exame Magazine. http://exame.abril.com.br/negocios/empresas/noticias/embraer-ve-clientes-mais-dispostos-compra-avioes-554715. Retrieved 8 February 2014. ^ "The N-11: More Than an Acronym". Retrieved on 17 March 2010. ^ (30 January 2013) "Brazil: Confronting the Productivity Challenge". Retrieved on 24 March 2013. ^ "Economy of Brazil". The World Factbook. Central Intelligence Agency. 2008. https://www.cia.gov/library/publications/the-world-factbook/geos/br.html. Retrieved 3 June 2008. ^ O'Neill, Jim. "BRICs". Goldman Sachs. http://www.goldmansachs.com/our-thinking/. Retrieved 6 June 2008. ^ Gasnier, Mat (15 January 2012). "The 20 biggest car markets in the world: Russia on the up!". Best Selling Cars. http://bestsellingcarsblog.com/2012/01/15/the-20-biggest-car-markets-in-the-world-russia-on-the-up/. Retrieved 17 November 2014. ^ "The economy of heat". The Economist. 12 April 2007. http://www.economist.com/node/8952496?story_id=8952496. Retrieved 6 June 2008. ^ "Brasil supera Canadá e se torna o terceiro maior exportador agrícola". O Estado de S. Paulo. 7 March 2010. http://www.estadao.com.br/estadaodehoje/20100307/not_imp520620,0.php. Retrieved 7 March 2010. ^ Wheatley, Jonathan (2 September 2002). "Brazil: When an IMF Bailout Is Not Enough". Business Week. http://www.businessweek.com/magazine/content/02_35/b3797071.htm. Retrieved 6 June 2008. ^ "Brazil to pay off IMF debts early". BBC News. 14 December 2005. http://news.bbc.co.uk/2/hi/business/4527438.stm. Retrieved 6 June 2008. ^ "Capital Flows to Emerging Markets Set at Close to Record Levels" (Press release). The Institute of International Finance. 31 May 2007. http://www.iif.com/press/press+32.php. Retrieved 6 June 2008. ^ "Statistics on Mergers & Acquisitions (M&A) – M&A Courses | Company Valuation Courses | Mergers & Acquisitions Courses". Imaa-institute.org. http://www.imaa-institute.org/statistics-mergers-acquisitions.html#MergersAcquisitions_Brazil. Retrieved 16 April 2011. ^ "Brazil: Corruption Costs $41 Billion". Latin Business Chronicle. http://www.latinbusinesschronicle.com/app/article.aspx?id=4550. Retrieved 22 March 2013. ^ "Exposing corrupt politicians? the effect of Brazil's publicly released audits on electoral outcomes". Quarterly Journal of Economics. May 2008. http://emlab.berkeley.edu/~ffinan/Finan_Audit.pdf. Retrieved 22 March 2013. ^ "Corruption perceptions index". Transparancy International. http://cpi.transparency.org/cpi2012/. Retrieved 22 March 2013. ^ "Rousseff Crisis Spurred by Lula Debts as Brazil Boom Diminishes- Bloomberg". Mobile.bloomberg.com. 27 September 2011. http://mobile.bloomberg.com/news/2011-09-27/rousseff-crisis-spurred-by-lula-debts-as-brazil-boom-diminishes. Retrieved 7 April 2012. ^ Alok Bansal; Yogeshwari Phatak; I C Gupta; Rajendra Jain (2009). Transcending Horizons Through Innovative Global Practices. Excel Books. p. 29. ISBN 978-81-7446-708-9. http://books.google.com/books?id=Wm4IWvB4rEUC&pg=PA29. ^ a b "Field Listing – GDP – composition by sector". The World Factbook. Central Intelligence Agency. 2008. https://www.cia.gov/library/publications/the-world-factbook/fields/2012.html. Retrieved 9 June 2008. ^ Steve Luck (1998). The American Desk Encyclopedia. Oxford University Press. p. 121. ISBN 978-0-19-521465-9. http://books.google.com/books?id=o8MdoOd6pOcC&pg=PA121. ^ Paolo Maria Giordano; Francesco Lanzafame; Jörg Meyer-Stamer (2005). Asymmetries in Regional Integration And Local Development. IDB. p. 129. ISBN 978-1-59782-004-2. http://books.google.com/books?id=-HZoGDAc_y0C&pg=PA129. ^ Michael Schmidt; Vincent Onyango; Dmytro Palekhov (2011). Implementing Environmental and Resource Management. Springer. p. 42. ISBN 978-3-540-77568-3. http://books.google.com/books?id=67bRqegVVcwC&pg=PA42. ^ OECD; Organisation for Economic Co-operation and Development; Organisation for Economic Co-Operation and Development Staff (2001). OECD Economic Surveys: Brazil 2001. OECD Publishing. p. 193. ISBN 978-92-64-19141-9. http://books.google.com/books?id=T6U8AUm1ef4C&pg=PA193. ^ Lael Brainard; Leonardo Martinez-Diaz (2009). Brazil As an Economic Superpower? : Understanding Brazil's Changing Role in the Global Economy. Brookings Institution Press. p. 45. ISBN 978-0-8157-0365-5. http://books.google.com/books?id=gG3EhGct-z0C&pg=PA45. ^ OECD (2005). OECD Economic Surveys: Brazil 2005. OECD Publishing. p. 105. ISBN 978-92-64-00749-9. http://books.google.com/books?id=kdYCwdYoyX4C&pg=PA105. ^ a b "UNWTO Tourism Highlights - 2011 Edition". World Tourism Organization. June 2011. http://mkt.unwto.org/sites/all/files/docpdf/unwtohighlights11enhr_1.pdf. Retrieved 29 September 2011. ^ a b "Estatisticas e Indicadores: Receita Cambial" (in Portuguese). Ministério do Turismo. 2012. http://www.dadosefatos.turismo.gov.br/dadosefatos/home.html. Retrieved 13 February 2012. ^ a b Ministério do Turismo (13 January 2012). "Turismo Brasileiro com novo recorde em 2011" (in Portuguese). No Pátio. http://www.nopatio.com.br/o-que-acontece/turismo-brasileiro-com-novo-recorde-em-2011/. Retrieved 13 February 2012. ^ Guilherme Lohmann Palhares (2012). Tourism in Brazil: Environment, Management and Segments. Routledge. p. 126. ISBN 978-0-415-67432-4. http://books.google.com/books?id=O91SVF9nH8gC&pg=PA126. ^ a b Jennifer Blanke and Thea Chiesa, Editors (2011). "Travel & Tourism Competitiveness Report 2011". World Economic Forum, Geneva, Switzerland. http://www3.weforum.org/docs/WEF_TravelTourismCompetitiveness_Report_2011.pdf. Retrieved 14 March 2011. ^ World Tourism Organization (2007). "UNWTO Tourism Highlights, Edition 2007". UNWTO. http://www.unwto.org/facts/eng/pdf/highlights/highlights_07_eng_hr.pdf. Retrieved 14 June 2008. ^ The World Tourism Organization. "Tourism Highlights 2006 [pdf"]. http://www.worldtourism.org/facts/eng/pdf/highlights/highlights_06_eng_lr.pdf. Retrieved 6 January 2006. ^ "UNTWO Tourism Highlights 2010 Edition". World Tourism Organization. 2010. http://unwto.org/facts/menu.html. Retrieved 31 October 2010. Click on the link "UNWTO Tourism Highlights" to access the pdf report. ^ Fundação Instituto de Pesquisas Econômicas e EMBRATUR (2006). "Caracterização e Dimensionamento do Turismo Domêstico no Brasil 2002 e 2006: Metodologia e Desenvolvimento" (in Portuguese). Ministério do Turismo. http://www.braziltour.com/site/arquivos/dados_fatos/demanda%20turistica/demanda_turismo_domestico_setembro_2006.pdf. Retrieved 22 June 2008. ^ Carmen Altés (2006). "El Turismo en América Latina y el Caribe y la experiencia del BID" (in Spanish). Inter-American Development Bank; Sustainable Development Department, Technical Paper Series ENV-149, Washington, D.C.. p. 9 and 47. http://idbdocs.iadb.org/wsdocs/getdocument.aspx?docnum=984876. Retrieved 14 June 2008. ^ Margerida Coelho (2008). "Distribução Espacial da Ocupação no Setor de Turismo: Brasil e Regiões" (in Portuguese). Instituto de Pesquisa Econômica Aplicada. http://www.ipea.gov.br/sites/000/2/publicacoes/tds/td_1320.pdf. Retrieved 22 June 2008. ^ Fundação Instituto de Pesquisas Econômicas (2007). "Caracterização e Dimensionamento do Turismo Domêstico no Brasil 2002 e 2006" (in Portuguese). Ministério do Turismo. http://200.189.169.141/site/arquivos/dados_fatos/demanda%20turistica/relatorio_executivo___turismo_domestico___2002_e_2006.pdf. Retrieved 21 June 2008. ^ Diretoria de Turismo (2006). "Boletim Anual São Paulo Turismo" (in Portuguese) (PDF). Prefeitura de São Paulo. http://www.cidadedesaopaulo.com/pesquisa/pdf/rel_boletim_anual_pesquisas_spturis_%202006.pdf. Retrieved 20 November 2008. see 2.1.3 "Receitas setor trurístico 2005". ^ Organisation for Economic Co-operation and Development; Organisation for Economic Co-Operation and Development Staff (2006). OECD Economic Surveys: Brazil 2006. OECD Publishing. p. 94. ISBN 978-92-64-02999-6. http://books.google.com/books?id=lI8pqyWIluYC&pg=PA94. ^ United Nations Educational, Scientific (2010). UNESCO Science Report 2010: The Current Status of Science Around the World. UNESCO. pp. 110–118. ISBN 978-92-3-104132-7. http://books.google.com/books?id=2ZTLCOe_fqwC&pg=PA110. ^ Brian Harvey; Henk H. F. Smid; Thâeo Pirard (2010). Emerging Space Powers: The New Space Programs of Asia, the Middle East and South-America. Springer. p. 324. ISBN 978-1-4419-0874-2. http://books.google.com/books?id=XD1ZaYbiWwMC&pg=PA324. ^ John J. Crocitti; Monique Vallance (2011). Brazil Today: An Encyclopedia of Life in the Republic: An Encyclopedia of Life in the Republic. The University of Chicago. p. 628. ISBN 978-0-313-34673-6. http://books.google.com/books?id=vP9jHaoL_s4C&pg=PA628. ^ O.C. Ferreira. "O Sistema Elétrico Brasileiro". http://www.ecen.com/eee32/sistelet.htm. Retrieved 21 March 2013. ^ "Confirmed: Agreement with France Includes the Brazilian Nuclear Submarine". Nonproliferation for Global Security Foundation. 23 December 2008. http://npsglobal.org/eng/news/139-peaceful-uses/490-confirmed-agreement-with-france-includes-the-brazilian-nuclear-submarine.html. Retrieved 23 December 2008. ^ "Rheinische Friedrich-Wilhelms-Universität". Elsa.physik.uni-bonn.de. 18 August 2008. http://www-elsa.physik.uni-bonn.de/accelerator_list.html. Retrieved 30 October 2010. ^ "CEITEC". Brasil.gov.br. Archived from the original on 17 November 2011. https://web.archive.org/web/20111117055936/http://www.brasil.gov.br/sobre/science-and-technology/the-digital-electronics-industry/ceitec/br_model1?set_language=en. Retrieved 8 August 2011. ^ "Road system in Brazil". Nationsencyclopedia.com. http://www.nationsencyclopedia.com/Americas/Brazil-TRANSPORTATION.html. Retrieved 30 October 2010. ^ Guilherme Lohmann Palhares (2012). Tourism in Brazil: Environment, Management and Segments. Routledge. p. 48. ISBN 978-0-415-67432-4. http://books.google.com/books?id=O91SVF9nH8gC&pg=PA48. ^ Gerard Martin La Forgia; Bernard F. Couttolenc (2008). Hospital Performance in Brazil: The Search for Excellence. World Bank Publications. p. 17. ISBN 978-0-8213-7359-0. http://books.google.com/books?id=i3R43xW5KqcC&pg=PA17. ^ Lawrence F. Wolper (2004). Health Care Administration: Planning, Implementing, and Managing Organized Delivery Systems. Jones & Bartlett Learning. p. 33. ISBN 978-0-7637-3144-1. http://books.google.com/books?id=Zts-QdpDiWUC&pg=PA33. ^ Ministério do Planejamento website, "Saúde" (fact sheet, 2002). Retrieved 12 June 2007. ^ a b "World Health Organization: Brazil: Malaria". http://rbm.who.int/wmr2005/profiles/brazil.pdf. ^ Usa Ibp Usa (2005). Brazil: Tax Guide. Int'l Business Publications. p. 42. ISBN 978-0-7397-3279-3. http://books.google.com/books?id=dzhWjfK8CswC&pg=PA42. ^ The Central Intelligence Agency (2010). The World Factbook 2010: (Cia's 2009 Edition). Potomac Books, Inc.. p. 143. ISBN 978-1-59797-541-4. http://books.google.com/books?id=m-9eSrZtYAAC&pg=PA143. ^ World Bank (2001). Rural Poverty Alleviation in Brazil: Towards an Integrated Strategy. World Bank Publications. p. 40. ISBN 978-0-8213-5206-9. http://books.google.com/books?id=YttV-Ggq90UC&pg=PA40. ^ "Rede Globo se torna a 2ª maior emissora do mundo" (in Portuguese). O Fuxico. http://ofuxico.terra.com.br/noticias-sobre-famosos/rede-globo-se-torna-a-2-maior-emissora-do-mundo/2012/05/11-139187.html. Retrieved 22 May 2012. ^ Roberto Gonzalez Echevarría; Enrique Pupo-Walker (1996). The Cambridge History of Latin American Literature. Cambridge University Press. p. 13. ISBN 978-0-521-41035-9. http://books.google.com/books?id=97NoYRx96ZAC&pg=PA13. ^ Bryan McCann (2004). Hello, Hello Brazil: Popular Music in the Making of Modern Brazil. Duke University Press. p. 22. ISBN 978-0-8223-3273-2. http://books.google.com/books?id=yq8wb7lQJ-EC&pg=PA22. ^ David Ward (2007). Television and Public Policy: Change and Continuity in an Era of Global Liberalization. Routledge. p. 28. ISBN 978-0-203-87728-9. http://books.google.com/books?id=zdEs1Av1CvAC&pg=PA28. ^ "Um ponto de IBOPE equivale a quantas pessoas? E domicílios?". IBOPE. http://www.ibope.com.br/pt-br/relacionamento/duvidas-frequentes/Paginas/Audiencia-de-televisao.aspx. Retrieved 23 March 2013. ^ "Top 10 das novelas". MSN Brasil. http://entretenimento.br.msn.com/famosos/top-10-das-novelas?page=0px. Retrieved 23 March 2013. ^ Marcelo S. Alencar (2009). Digital Television Systems. Cambridge University Press. pp. 179–181. ISBN 978-0-521-89602-3. http://books.google.com/books?id=M96rKRAqHFgC&pg=PA179. ^ "Brazil launches international TV station for Africa". BBC News. 25 May 2010. http://www.bbc.co.uk/news/10152301. Retrieved 30 October 2010. ^ "Brazil population reaches 190.8 million". Brasil.gov.br. ^ José Alberto Magno de Carvalho, "Crescimento populacional e estrutura demográfica no Brasil" Belo Horizonte: UFMG/Cedeplar, 2004 (PDF file), p. 5. ^ "Instituto Brasileiro de Geografia e Estatística". IBGE. 29 November 1999. http://www.ibge.gov.br/home/presidencia/noticias/noticia_visualiza.php?id_noticia=1275&id_pagina=1. Retrieved 25 January 2010. ^ "Projeção da População do Brasil – Brazil's populational projection". IBGE. http://www.ibge.gov.br/home/presidencia/noticias/noticia_impressao.php?id_noticia=1272. Retrieved 25 January 2010. ^ Magno de Carvalho, "Crescimento populacional e estrutura demográfica no Brasil," pp. 7–8. ^ "Tendências Demográficas: Uma análise da população com base nos resultados dos Censos Demográficos 1940 e 2000". Ibge.gov.br. http://www.ibge.gov.br/home/estatistica/populacao/tendencia_demografica/analise_populacao/1940_2000/default.shtm. Retrieved 7 April 2012. ^ Antonio Carlos Lacerda (5 April 2011). "Demographical census reveals Brazil as older and less white". Port.pravda.ru. Archived from the original on 7 June 2011. https://web.archive.org/web/20110607201813/http://port.pravda.ru/sociedade/curiosas/04-05-2011/31548-censo_demografico-0/. Retrieved 7 April 2012. ^ "Self-declared White Brazilians decrease in number, says IBGE". Fatimanews.com.br. http://www.fatimanews.com.br/noticias/populacao-que-se-declara-branca-diminui-diz-ibge_116224/. Retrieved 7 April 2012. ^ (2010) "Allele frequencies of 15 STRs in a representative sample of the Brazilian population". Forensic Science International: Genetics 4 (2): e61. DOI:10.1016/j.fsigen.2009.05.006. PMID 20129458. ^ NMO Godinho O impacto das migrações na constituição genética de populações latino-americanas. PhD Thesis, Universidade de Brasília (2008). ^ a b (2011) "The Genomic Ancestry of Individuals from Different Geographical Regions of Brazil Is More Uniform Than Expected". PLoS ONE 6 (2): e17063. DOI:10.1371/journal.pone.0017063. PMID 21359226. ^ Parra et alli, Color and genomic ancestry in Brazilians. ^ (2009) "Genetic signatures of parental contribution in black and white populations in Brazil". Genetics and Molecular Biology 32 (1): 1–11. DOI:10.1590/S1415-47572009005000001. PMID 21637639. ^ (2009) "Genetic heritage variability of Brazilians in even regional averages, 2009 study". Brazilian Journal of Medical and Biological Research 42 (10): 870–6. DOI:10.1590/S0100-879X2009005000026. PMID 19738982. ^ Kevin Boyle; Juliet Sheen (2013). Freedom of Religion and Belief: A World Report. Routledge. p. 211. ISBN 978-1-134-72229-7. http://books.google.com/books?id=JxgFWwK8dXwC&pg=PT211. ^ "Brazil". Berkley Center for Religion, Peace, and World Affairs. http://berkleycenter.georgetown.edu/resources/countries/brazil. Retrieved 7 December 2011. ^ Brian Morris (2006). Religion and Anthropology: A Critical Introduction. Cambridge University Press. p. 223. ISBN 978-0-521-85241-8. http://books.google.com/books?id=PguGB_uEQh4C&pg=PA223. ^ William Jeynes; David W. Robinson (2012). International Handbook of Protestant Education. Springer. p. 405. ISBN 978-94-007-2386-3. http://books.google.com/books?id=NIBlry_2oLQC&pg=PA405. ^ "Brazil". Berkley Center for Religion, Peace, and World Affairs. http://berkleycenter.georgetown.edu/resources/countries/brazil. Retrieved 7 December 2011. See drop-down essay on "The Growth of Religious Pluralism"
^ a b Do G1, em São Paulo (23 August 2011). "G1 – País tem menor nível de adeptos do catolicismo desde 1872, diz estudo – notícias em Brasil". G1.globo.com. http://g1.globo.com/brasil/noticia/2011/08/pais-tem-menor-nivel-de-adeptos-do-catolicismo-desde-1872-diz-estudo.html. Retrieved 7 April 2012. ^ "IDBGE" (in pt). IBGE. 2011. http://www.ibge.gov.br/home/estatistica/populacao/censo2010/default.shtm. Retrieved 8 October 2011. ^ "Principal Cities". Encarta. MSN. http://encarta.msn.com/encyclopedia_761554342_3/Brazil.html. Retrieved 10 June 2008. ^ "People of Brazil". The World Factbook. Central Intelligence Agency. 2008. https://www.cia.gov/library/publications/the-world-factbook/geos/br.html. Retrieved 3 June 2008. ^ Charles J. Russo (2011). The Legal Rights of Students with Disabilities: International Perspectives. Rowman & Littlefield Publishers. p. 45. ISBN 978-1-4422-1085-1. http://books.google.com/books?id=JuV1cZ7NJHIC&pg=PA45. ^ "Learn About Portuguese Language". Sibila.com.br. http://www.sibila.com.br/index.php/world-map-of-portuguese/424. Retrieved 7 April 2012. ^ a b c "Languages of Brazil". Ethnologue. http://www.ethnologue.com/show_country.asp?name=br. Retrieved 9 June 2008. ^ "Portuguese language and the Brazilian singularity". http://countrystudies.us/brazil/39.htm. ^ Nash, Elizabeth (2 May 2008). "Portugal pays lip service to Brazil's supremacy". London: The Independent. Archived from the original on 24 June 2011. https://web.archive.org/web/20110624131043/http://www.independent.co.uk/news/world/europe/portugal-pays-lip-service-to-brazils-supremacy-819728.html. Retrieved 9 June 2008. ^ Rohter, Larry (28 August 2005). "Language Born of Colonialism Thrives Again in Amazon". New York Times. http://www.nytimes.com/2005/08/28/international/americas/28amazon.html?ex=1282881600&en=2dbb31357d010164&ei=5090. Retrieved 14 July 2008. ^ "O alemão lusitano do Sul do Brasil". DW-World.de. http://www.dw.de/dw/article/0,,1174391,00.html. ^ "Approvato il progetto che dichiara il 'Talian' come patrimonio del Rio Grande del Sud – Brasile". Sitoveneto. http://www.sitoveneto.org/talian_patrimonio_de_rio_grando_do_sul.html. Retrieved 9 March 2012. ^ Patrick Stevenson (1997). The German Language and the Real World: Sociolinguistic, Cultural, and Pragmatic Perspectives on Contemporary German. Oxford University Press. p. 39. ISBN 978-0-19-823738-9. http://books.google.com/books?id=AviTvt-cPaUC&pg=PA39. ^ "Esperanto approved by Brazilian government as optional high school subject, mandatory if justified by demand". Page F30. 19 September 2009. http://www.pagef30.com/2009/09/15-september-2009-esperanto-approved-by.html. Retrieved 30 October 2010. ^ Teresa A. Meade (2009). A Brief History of Brazil. Infobase Publishing. p. 146. ISBN 978-0-8160-7788-5. http://books.google.com/books?id=e6Jw-KNq2QUC&pg=PA146. ^ David Levinson (1998). Ethnic Groups Worldwide: A Ready Reference Handbook. Greenwood Publishing Group. p. 325. ISBN 978-1-57356-019-1. http://books.google.com/books?id=uwi-rv3VV6cC&pg=PA325. ^ Jeffrey Lesser (2013). Immigration, Ethnicity, and National Identity in Brazil, 1808 to the Present. Cambridge University Press. pp. 150–155. ISBN 978-0-521-19362-7. http://books.google.com/books?id=HJW029DYOZoC&pg=PA150. ^ Freyre, Gilberto (1986). "The Afro-Brazilian experiment: African influence on Brazilian culture". UNESCO. http://findarticles.com/p/articles/mi_m1310/is_1986_May-June/ai_4375022. Retrieved 8 June 2008. ^ Leslie Marsh (2012). Brazilian Women's Filmmaking: From Dictatorship to Democracy. University of Illinois Press. p. 3. ISBN 978-0-252-09437-8. http://books.google.com/books?id=I5F7E6BQ5ukC&pg=PA3. ^ a b Duduka Da Fonseca; Bob Weiner (1991). Brazilian Rhythms for Drumset. Alfred Music Publishing. p. 7. ISBN 978-0-7692-0987-6. http://books.google.com/books?id=HuZQUm_hhygC&pg=PA7. ^ Donna M. Di Grazia (2013). Nineteenth-Century Choral Music. Routledge. p. 457. ISBN 978-1-136-29409-9. http://books.google.com/books?id=qyPz1PUFxW8C&pg=PA457. ^ "UNESCO Culture Sector - Intangible Heritage - 2003 Convention:". Unesco.org. http://www.unesco.org/culture/ich/index.php?RL=00101. Retrieved 4 June 2013. ^ Larry Crook (2009). Focus: Music of Northeast Brazil. Taylor & Francis. p. 78. ISBN 978-0-415-96066-3. http://books.google.com/books?id=Skjwor64MXwC&pg=PA78. ^ Peter Fryer (2000). Rhythms of Resistance: African Musical Heritage in Brazil. Pluto Press. p. 39. ISBN 978-0-7453-0731-2. http://books.google.com/books?id=Pj3i3t1xliUC&pg=PA39. ^ Chris MacGowan; Ricardo Pessanha (1998). The Brazilian Sound: Samba, Bossa Nova, and the Popular Music of Brazil. Temple University Press. pp. 159–161. ISBN 978-1-56639-545-8. http://books.google.com/books?id=7MFD-EoTR7MC&pg=PA159. ^ Chris MacGowan; Ricardo Pessanha (1998). The Brazilian Sound: Samba, Bossa Nova, and the Popular Music of Brazil. Temple University Press. p. 6. ISBN 978-1-56639-545-8. http://books.google.com/books?id=7MFD-EoTR7MC&pg=PA6. ^ Gayle Kassing (2007). History of Dance: An Interactive Arts Approach. Human Kinetics 10%. p. 236. ISBN 978-0-7360-6035-6. http://books.google.com/books?id=_lLoTsT2X5EC&pg=PA236. ^ Michael Campbell (2011). Popular Music in America: The Beat Goes on. Cengage Learning. p. 299. ISBN 978-0-8400-2976-8. http://books.google.com/books?id=rK5DMAZsuAgC&pg=PT299. ^ John J. Crocitti; Monique M. Vallance (2012). Brazil Today: An Encyclopedia of Life in the Republic. ABC-CLIO. p. 360. ISBN 978-0-313-34672-9. http://books.google.com/books?id=VhkvhllLooUC&pg=PA360. ^ Beatriz Mugayar Kühl, Arquitetura do ferro e arquitetura ferroviária em São Paulo: reflexões sobre a sua preservação, p.202. Atelie Editorial, 1998. ^ Daniel Balderston and Mike Gonzalez, Encyclopedia of Latin American and Caribbean Literature, 1900–2003, p.288. Routledge, 2004. ^ "Way of Life". Encarta. MSN. http://encarta.msn.com/encyclopedia_761554342_4/Brazil.html. Retrieved 8 June 2008. ^ Roger, "Feijoada: The Brazilian national dish" braziltravelguide.com. ^ Ronald H. Bayor (2011). Multicultural America: An Encyclopedia of the Newest Americans. Georgia Institute of Technology. p. 181. ISBN 978-0-313-35786-2. http://books.google.com/books?id=bJW79Rlu-igC&pg=PA181. ^ Barbosa, Lívia (2007). "Feijão com arroz e arroz com feijão: o Brasil no prato dos brasileiros". Horizontes Antropológicos 13 (28). DOI:10.1590/S0104-71832007000200005. ^ Ferraccioli, Patrícia; Silveira, Eliane Augusta da (2010). "Cultural feeding influence on palative memories in the usual brazilian cuisine". Rev. Enferm. UERJ 18 (2): 198–203. ^ "Futebol, o esporte mais popular do Brasil, é destaque no Via Legal :: Notícias". Jusbrasil.com.br. http://justica-federal.jusbrasil.com.br/noticias/74894/futebol-o-esporte-mais-popular-do-brasil-e-destaque-no-via-legal. Retrieved 16 April 2011. ^ "Football in Brazil". Goal Programme. International Federation of Association Football. 15 April 2008. http://www.fifa.com/associations/association=bra/goalprogramme/index.html. Retrieved 6 June 2008. ^ "Beach Soccer". International Federation of Association Football. http://www.fifa.com/aboutfifa/developing/beachsoccer/index.html. Retrieved 6 June 2008. ^ "Futsal". International Federation of Association Football. http://www.fifa.com/aboutfifa/developing/futsal/index.html. Retrieved 6 June 2008. ^ "The art of capoeira". BBC. 20 September 2006. http://www.bbc.co.uk/northyorkshire/content/articles/2005/09/13/capoeira_feature.shtml. Retrieved 6 June 2008. ^ "Brazilian Vale Tudo". I.V.C. http://valetudo.com.br/. Retrieved 6 June 2008. ^ "International Brazilian Jiu-Jitsu Federation". International Brazilian Jiu-Jitsu Federation. Archived from the original on 20 April 2008. https://web.archive.org/web/20080420155232/http://www.ibjjf.org/index.htm. Retrieved 6 June 2008. ^ Donaldson, Gerald. "Emerson Fittipaldi". Hall of Fame. The Official Formula 1 Website. http://www.formula1.com/teams_and_drivers/hall_of_fame/282/. Retrieved 6 June 2008. ^ Donaldson, Gerald. "Nelson Piquet". Hall of Fame. The Official Formula 1 Website. http://www.formula1.com/teams_and_drivers/hall_of_fame/181/. Retrieved 6 June 2008. ^ Donaldson, Gerald. "Ayrton Senna". Hall of Fame. The Official Formula 1 Website. http://www.formula1.com/teams_and_drivers/hall_of_fame/45/. Retrieved 6 June 2008. ^ "1950 FIFA World Cup Brazil". Previous FIFA World Cups. International Federation of Association Football. http://www.fifa.com/worldcup/archive/edition=7/index.html. Retrieved 6 June 2008. ^ "2014 FIFA World Cup Brazil". International Federation of Association Football. http://www.fifa.com/worldcup/preliminarydraw/index.html. Retrieved 6 June 2008. ^ "The Official Formula 1 Website". Formula One Administration. Archived from the original on 4 June 2008. https://web.archive.org/web/20080604141640/http://www.formula1.com/races/in_detail/brazil_804/circuit_diagram.html. Retrieved 6 June 2008. ^ Ming Li; Eric W. MacIntosh; Gonzalo A. Bravo (2011). International Sport Management. Human Kinetics - College of Business at Ohio University. p. 129. ISBN 978-1-4504-2241-3. http://books.google.com/books?id=udBgtzFSlBIC&pg=PA129. ^ "FIBA World Championship History (pdf)". FIBA. 1 January 2007. http://www.fiba.com/downloads/v3_abouFiba/mp/FIBA_world_championships_history.pdf. Retrieved 24 February 2012. Souza, Adriana Barreto de. Duque de Caxias: o homem por trás do monumento. Rio de Janeiro: Civilização Brasileira, 2008. (Portuguese) ISBN 978-85-200-0864-5. "Background Note: Brazil". US Department of State. http://www.state.gov/r/pa/ei/bgn/35640.htm. Retrieved 16 June 2011. This page uses content from the English language Wikipedia. The original content was at Brazil. The list of authors can be seen in the page history. As with this Familypedia wiki, the content of Wikipedia is available under the Creative Commons License.